For most of my woodworking journey my workbench consisted on a 24”x36” rolling shop cabinet with an oak top made from reclaimed pallet wood. Since my new shop is almost complete I decided to pull out a maple slab that I have been storing in my shed for the last three years and build myself a proper workbench. 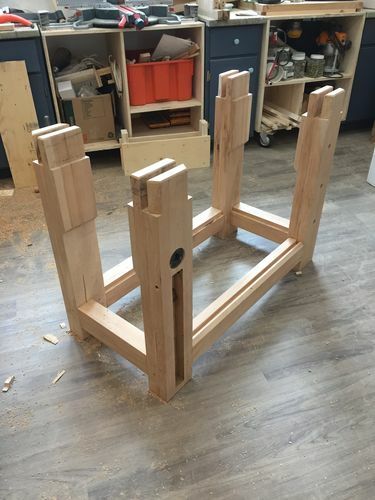 I decided to build a traditional Roubo style bench guided by the plans in Chris Schwarz’s Workbenches book. 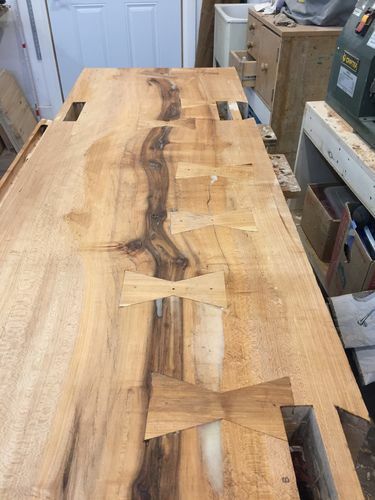 My bench is 5’8” long, 21”wide and 32” high. The top is one piece of hard maple. It was 4” thick but had quite a twist in it. 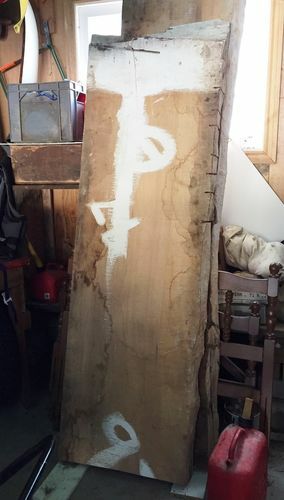 I flattened it with a router and sled and it finished at 3” thick. There was a large crack in the centre which I reinforced top and bottom with butterfly splines. The legs and stretchers are about 3” x5” and laminated from two pieces of maple. The end vice is from my old workbench and I splurged an bought a Benchcrafted face vice. The vice chops and sliding deadman are made from some roasted maple that I had in my shed. The shelf is made from left over hardwood flooring. I cut the tenons using hand saws. The mortises were hogged out using a power drill but both the mortises and tennons were fitting by chopping and pairing with a chisel. I used drawboard pegs on all the joints. Gaps were tightened by driving in wedges. The bench is rock solid and I’m looking forward to many years of use. I see many exciting projects coming from the work bench. Woodbridge this is a beauty. really impressive. Peter, it looks great. Why the taper on the legs? Thanks folks. TOF – the legs are straight. 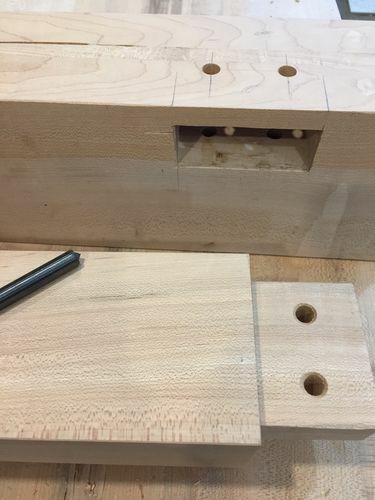 I added one inch pieces (cut-offs) to the top of each leg to beef them up to 4” x 5” and provide more bearing surface for the top and also to increase the weight of the bench.. I love it when a nice workbench comes up in the projects feed. This one is a beaut ! Nice work. Slab is awesome. Another work bench too pretty to use. BTDTGTTS. Don’t forget to enter this beauty in the Workbench Smack down thread. Peter, hope you feel you can pound on this beauty! LOL! Nicely done, but that’s to be expected from a master craftsman. That’s one awesome bench. Wonderful choice for the top. You’ve got enough thickness to flatten many times, so you’re right, it will live longer than you (sorry). Thanks for looking folks and I appreciate the comments. Its definitely intended to be a user. I dressed this bench up with some extra coats of shellac to make it pretty for for the pictures. However, I’m not the neatest woodworker and no matter how hard I try to keep it looking pristine I suspect in a few months it will be covered in glue spots, paint and chisel nicks. Just need to work on my skills. roasted maple? I love it :) Looks beefy and pretty awesome. I’m in the midst of my roubo build, but using douglas fir. Will not look as family heirloom’ish as your bench though! Holbs – roasted maple is maple that has been heat treated to give it a chocolate brown colour. I bought it several years ago to use for a project that I never got to. Best thing is when you cut it or plane it it smells like maple syrup. That right there is as right proper a workbench as you caould have! very nicely done.